This handy steel can containing 420 rounds in 5.56 NATO can't wait to accompany your AR-15 on your next range trip! 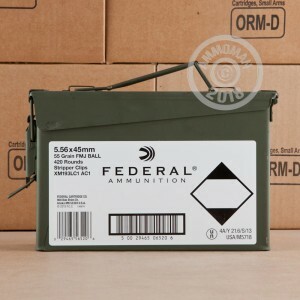 Manufactured to the M193 ball standard, this ammo comes from Lake City Army Ammunition Plant, where it is manufactured by Federal Premium Ammunition, the plant's contract operator. 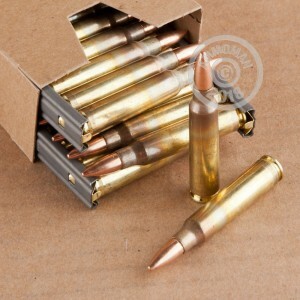 These rounds are an extremely popular choice for AR shooters due to their military origin and excellent reputation for quality. The 55-grain full metal jacket bullet achieves a muzzle velocity of about 3,240 feet per second. Like all Lake City ammo, these rounds use non-corrosive Boxer primers and reloadable brass cases, with the original case annealing discoloration (usually removed on commercial ammo) left to show that the cartridges have been manufactured correctly. If you plan to shoot this 5.56 NATO ammo in a .223 Remington firearm, you may want to check with your manufacturer regarding potential compatibility issues. Buy this case, or any other products that get your order total over $99, and AmmoMan.com will ship everything for FREE! Great price for great ammo! While you can get loose rounds of similar quality for a little less, IMO its worth paying a little more to have them come in a sealed ammo can on stripper clips if you are going to be loading them into standard metal or magpul ar-15 magazines. Fired a few sample rounds. No problems at all. Thanks ammo man. VERY quick delivery, excellent service. Will order again. works great , no problems with the ammo. Meets all of my AR15's needs! ANd my needs too. Easy ordering, fast shipping and a magazine loader enclosed. Great product. Will order again and again. Very satisfied with my purchase. I will buy again. the Federal ammo is a good shooting load. nice group at 100 yards. planning to shoot out to 200 yards soon with it. Great rounds, run flawless thru AR having them loaded on stripper clips for super fast reload is a big bonus. The rounds come in a sealed mil spec ammo can also make this worth the $$. I use stripper clips over and over again for the loose rounds that I buy. My order was at my door in 3 days! What is on the website is what it is. Great place to get all your ammo. This has to be the fastest shipping and NO bs at all. Arrived in 3 days. Was exactly as described and e-mail communications were fast to respond. Joe is excellent to deal with. This was my first order,but will definitely be a return customer.Everything was great.Thank you very much!! My ammo arrived quickly, and was in immaculate condition as well! AmmoMan are the good guys! ammo was exactly what I ordered and expected. ammo was clean and shipped in a reusable can. the price was very good plus it was shipped free. what you see in the ad is what you get,no surprises. this ammo should work great in my AR.